The Supper Samplings line was designed as a theoretical extension of the established popular Celestial Seasonings brand. 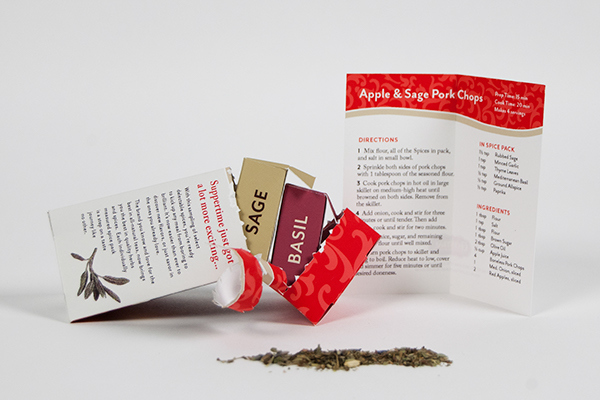 The entire line was created to fulfill the desire for cooking spices to be packaged in smaller containers to promote freshness and less waste while keeping the established look of Celestial Seasonings for those already committed to the brand. The Supper Samplings line provides the opportunity to try a selection of spices, be it new or already beloved, in a quick and easy to use collection for a particular dish. The triangular box is not only intriguing and dynamic just in visual design, but also provides efficiency in manufacturing, use, and disposal. 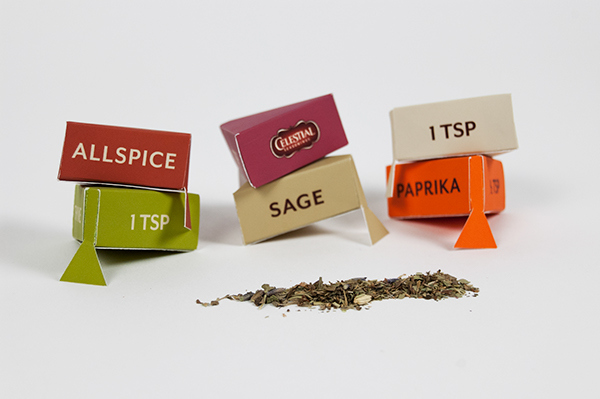 The easy to handle box contains a collection of spices perfectly per-measured for the specific dish that is identified by the unique imagery and patterns on the outer panels. 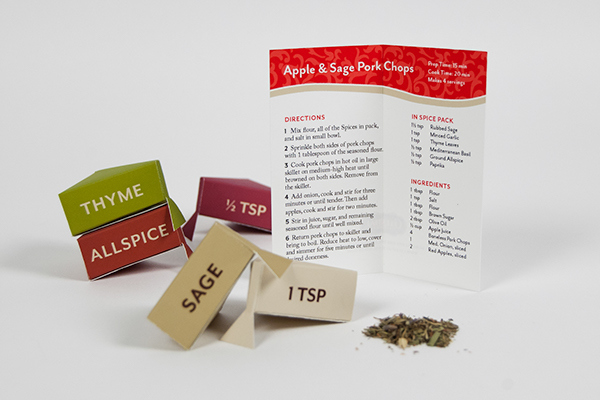 Along with the tabbed, easy to open spice containers, each Supper Sampling box is accompanied by a recipe card with instructions on how to utilize the spices to create a perfectly scrumptious meal. 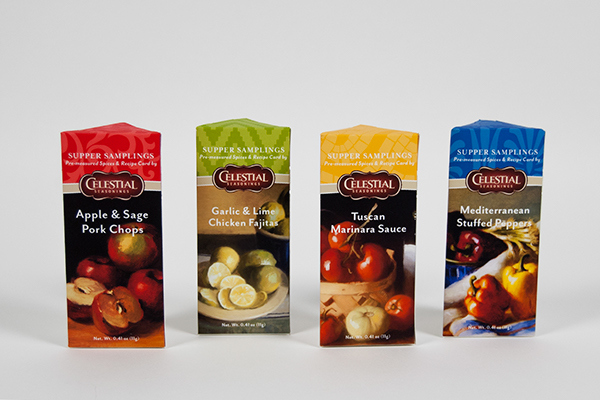 The Supper Samplings line was designed as a theoretical extension of the established popular Celestial Seasonings brand. 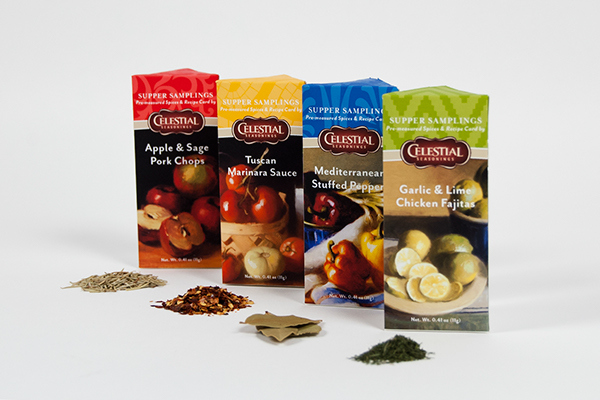 The entire line was created to fulfill the desire for cooking spices to be packaged in smaller containers for better longevity.